In actuality it is a method of dealing with steeks which hides the steek inside a few rows of knitting. 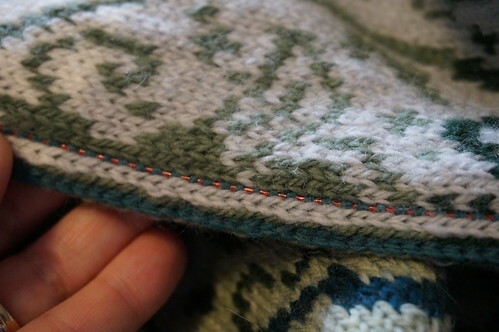 Stitches are picked up through the fabric on the right side, and then stitches are picked up from the loops on the wrong side, and a few rows of knitting are worked on both sides, completely enclosing the steek. The two flaps are then knit together, and the rest of the buttonband (or whatever) is finished. Here is a much more in depth post on the method, and is the reference I used in my researching. Kate Davies’ series on steeks is excellent – my post today will be a very quick overview on how I did my steek sandwich, so go to her website if you want more details! 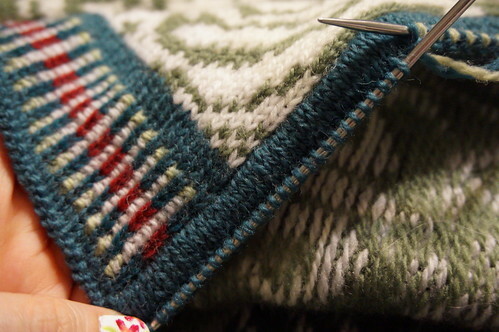 Stitches picked up on every row – exactly between the steek stitches and the pattern stitches. You have to be sure to pick the yarn up from behind the work, and through to the front, so that the working yarn carries across the back. This is what forms the loops you’ll use to pick up stitches on the back. It also reinforces the steek edge even more, since it locks all your floats! 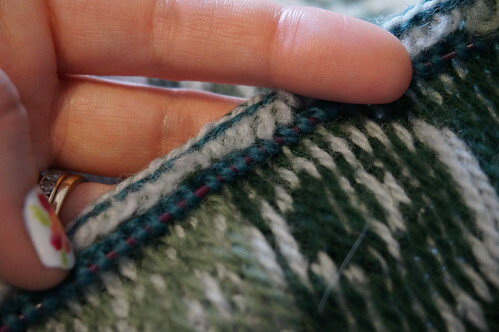 Then, using a second circular needle, you turn your work and pick up each loop on the back and knit into it. (Pull the yarn snug when working the first one.) This can be tricky, because the loops are pretty tight. 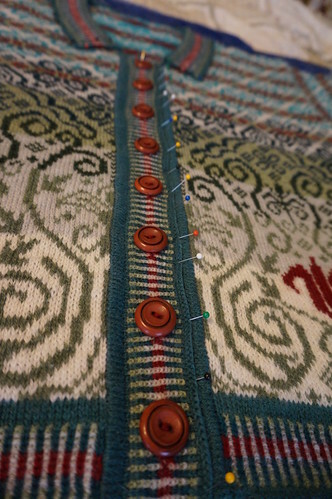 (You could help this by using a larger needle for picking up the front stitches, and then switching to the smaller needles for the rest of the buttonband, but I didn’t do that with my sweater.) I used a dpn to gently lift each loop, and then my working needle to knit into it. You must pick up one extra stitch on the back to have your stitch counts the same on both sides. Loops on back, each one picked up and knit. 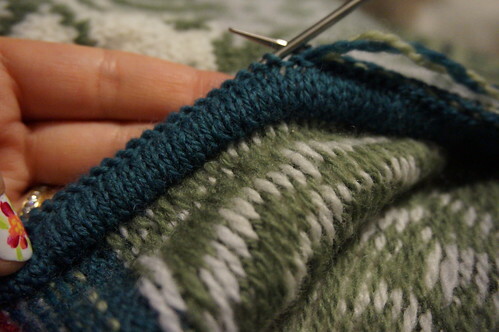 I worked four more rows total, front and back – ending with the wrong side completed. Now, you have two circular needles – one with the front stitches and one with the back stitches. Front and back knit together. You will use your front circular needle, and knit the front and the back stitches together across the row (as though you were doing a three needle bind off – but without the binding off.) That finishes the sandwich! Front and back knit together (back/wrong side view) See how the steek is hidden – doesn’t that look nice?? Then you finish off the buttonband however you wish – I did corrugated ribbing for my sweater, but you could do an i-cord, or some other edge for the finishing. I forgot to take a close up shot of the finished band – this picture will have to do! So here’s how the band looks when complete. So that’s how I did my steek sandwiches for my sweater! It adds a bit of bulk to the edge, but that’s not necessarily a bad thing at the buttonbands, where you want some stability. I hope this was informative! Happy Knitting!! Previous postIt’s in the mail! Good tutorial. Thank you for sharing. 🙂 Thanks! And you’re welcome! This may be the best steek finishing tutorial that I have seen! Great pics and explanation! Thank you! !